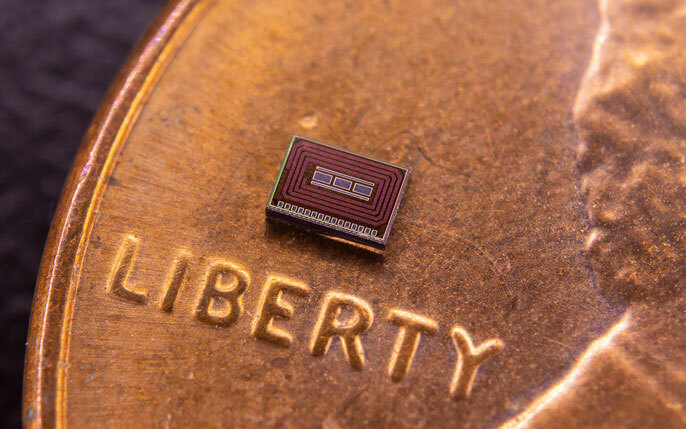 The alcohol monitoring chip is small enough to be implanted just under the surface of the skin. The chip compared to the thickness of a penny. The team has filed a provisional patent on this technology. Contact Skip Cynar in the campus Innovation and Commercialization Office at scynar@ucsd.edu or (858)-532-2672 for licensing information. Paper title: “A Sub-1 μW Multiparameter Injectable BioMote for Continuous Alcohol Monitoring.” Authors of the study are Haowei Jiang*, Xiahan Zhou*, Saurabh Kulkarni, Michael Uranian, Rajesh Seenivasan, and Drew A. Hall at UC San Diego. This work was partially supported by the National Science Foundation (1621825), the National Institutes of Health (R41DA044905), and Samsung.